We are pleased to launch our Time- Lapse AXIS Camera application. Use case: You have an AXIS Camera and would like to use it to make Time-lapse movies. We made a feature on our iOS app “Viewer for AXIS Cams” to make Time- lapse movies. This feature uses a process called App Injection to load an AXIS Camera application (ACAP) onto an AXIS Cam. 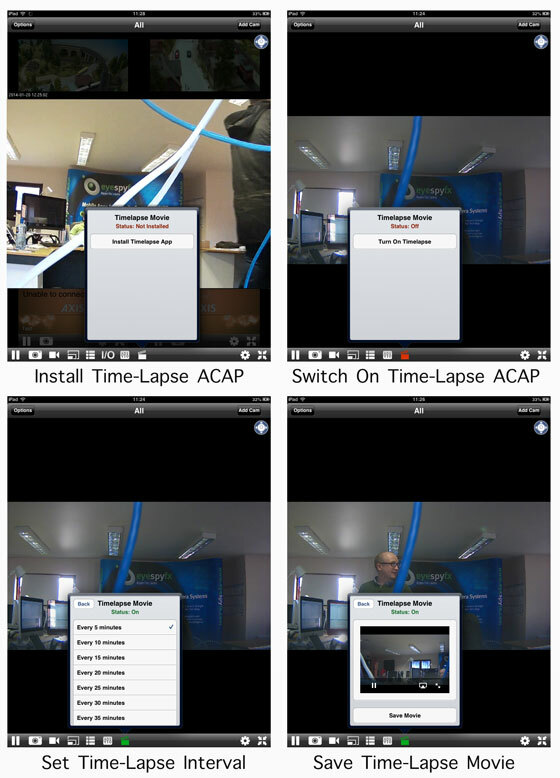 Once the Time-lapse ACAP is loaded you can start making time-lapse movies using “Viewer for AXIS Cams”. The status of the icon (a film clapperboard) changes colour according to the status availability of the Time-Lapse App. The time-lapse interval is adjustable: the range goes: 5, 10, 15, 20, 25, 30 35 mins, 1 hr, 24 hr. This Time lapse app is envisaged as a tool for making a summary of the day or week. Time-lapse summaries can certainly be useful but also on occasion can be very beautiful….it all depends on the camera view. The finished time-lapse videos are saved into the camera roll of your iOS device (iPhone, iPad or iPOD). Once you have them saved there you can share them via Dropbox. As the images are uploaded from the camera they are stored in the cloud. Each time-lapse account stores 370 images. Once the 370th image is saved the first is deleted…and so it scrolls on. When a user requests a Time-lapse video from the app the images are sent to the iPhone and compiled by the app as a movie. The user then has the movie for that moment saved on their phone. 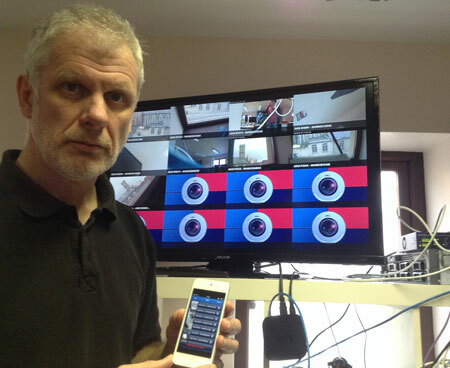 We have been doing some investigations regarding Apple TV and our Security Cam Apps. This is what we found. Project any EyeSpyFX Security Cam app onto a TV to allow large screen viewing. EyeSpyFX Security Cam App, for example Viewer for AXIS Camera Companion. Apple TV is a black box that allows you to project any (relatively new) Apple device to a TV. It is designed so you can project movies from your computer or iPod to your TV. This function uses an Apple projection system called AIRPLAY. It also has a range of built in content features like Netflix and YouTube and Vimeo. Apple TV costs about €100. Attaching Apple TV to the 40’ TV was easy: We simply plugged it in using a HDMI cable. The HDMI cable was not provided with the Apple TV unit (which is a bit mean of Apple we thought as the device is near useless without a HDMI cable). When you plug the Apple TV into your TV you enter the details of your WIFI network password to connect the Apple TV to your network. You enter the password using a screen based keyboard which you control using the remote control from the Apple TV. We did this here in the EyeSpyFX office and it worked fine, but we have lots of wifi devices in the office and our wifi is a bit overloaded so we opted to plug the Apple TV into our Network using a standard Ethernet cable. Next take your iOS device and on iOS 7 swipe up from the bottom of the screen to make the control panel appear. 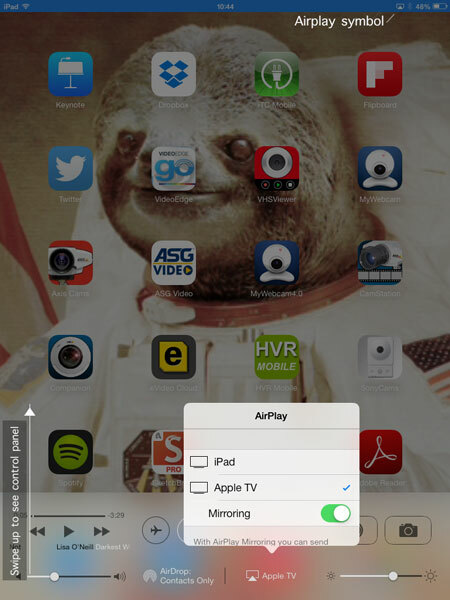 Select Apple TV and switch on Mirroring. Now open an EyeSpyFX app. Apple TV will work with all EyeSpyFX apps. The app will be mirrored on the TV. The best performance is when you turn the device into landscape mode as per in this snap, showing “Grid View” in “Viewer for AXIS Camera Companion”. 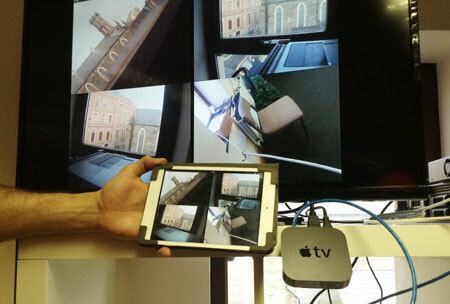 Projecting an app onto a TV is useful for basic viewing of security cameras on TV’s. Its a great way to monitor your business premises from home. To create optimised projection to a TV for example to use as a “Public View Monitor” we have created a special app called PVM for AXIS. This app is designed to work with Stand Alone IP Cameras (Viewer for AXIS Cams) or Cameras in an AXIS Camera Companion Site. The app is specifically designed to project to TV screens. Apple TV makes this app even easier to use. The app has special projection features like Guard Tour enabling automatic scrolling from one cam to another. The app maximizes use of the available TV screen size (rather than simply mirroring the App).